Our Leather Cleaning & Refurbishment service can clean, recolour, condition & re-seal your Leather furniture leaving it looking almost like new. Are you thinking its time to confine your leather suite to the rubbish heap and spend your hard earned money on a replacement! DONT JUST CLEAN IT, LEATHERFIX IT! CONDITIONING Sets it up for its renewed life – takes care of it all leaving your suite as good as it can possibly be! **Includes minor damage – Not widespread re-colouring or more serious damage which can be carried out at additional cost. FOR REALLY BADLY DAMAGED AREAS – WE CAN EVEN PROVIDE A FULL PANEL REPLACEMENT SERVICE (If its really, really Bad!). Car Interior Leather is much the same when it comes to picking up grime and grease deposits which can have a bad effect on how the car looks. Apart from any damage that might occur – car seats stand a lot of harsh useage wear & need special treatment to maintain them. Deep cleaning with a little well applied colour followed by a good reseal and conditioning will keep seats looking good and will most definitely help to achieve the very best resale value when the time comes to move the vehicle on. As an Upholstery material, pigmented Leather is one of the most, hard wearing and serviceable coverings you can buy. 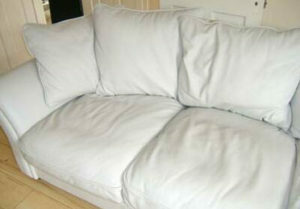 With around 85% of Leather upholstered lounge suites being covered in pigmented (corrected grain) Leather – that is your standard Cream, Black, Brown, etc suites that are all one colour with the surface applied pigment that, when sealed during manufacture, takes on the tough, hardwearing, durable and resilient characteristics that are pigmented leather. If looked after, that is wiped over regularly to remove any surface grime etc, these suites can last for many years (We exclude the very cheap imported “Buy One, Get One Free” units here since, in the main, with Leather upholstery – You very definitely do Get What You Pay For). Treating with a good conditioning cream once every 6 – 12 weeks will keep the material supple therefore less likely to dry out and crack, split or weaken along the natural creases or wrinkles that exisit. This is usually related to Aniline / Semi Aniline Leather suites with minimal surface staining but quite widespread colour loss due to wear or fading. It involves first of all cleaning the leather followed by colour matching the Aniline surface pigment. Subsequently large areas are recoloured using the matched pigment. The leather will then be sealed to provide longevity of surface and finally a really deep conditioning of the leather is carried out to put back the moisture vital to help prevent recurrence. In other words its all about getting the leather back on track! This Arctic White Corner sofa unit was a victim of child & animal activity. The Leather was otherwise in very good condition and the owner really just needed confirmation that it was past its sell by date! Not a bit of it! Leatherfix applied our deep cleaning system to it and although it was hard work we were able to restore it back to almost its former self. The refurb job included some repairs (scuffs, scratches & staining), a little recolouring, conditioning and resealing. Job Done! 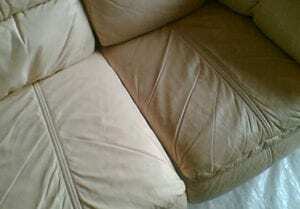 This is NOT a Recolouring job – This is the result of a seat cushion Deep Cleaned by Leatherfix. The work was carried out at a house where people smoked on a regular basis. The lady in question was so shocked at the result. She stopped Smoking! We are delighted with the Cleaning & Repairs done on our Cream 3 piece suite today. Les and his colleague Paul worked solidly all morning and the results were miraculous. 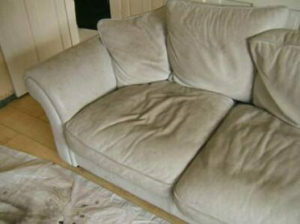 We wouldn’t hesitate to recommend Leatherfixuk.com. Thanks Again.